You sometimes need to join only one related record for each parent record, for example one order line for each order header. I’m always suspicious of such requirements, because it often means that users/analysts didn’t realize that there may be more than one record, or they didn’t think enough of identifying the one record they actually need. Nevertheless there are valid scenarios when showing only the first or the last record is exactly what’s required. If you wrote it in T-SQL, you could use a subquery, but how to achieve the same in AX? If you read my blog post about Subqueries in views, you already know that computed columns can be for building subqueries. Let’s apply the same approach to this problem. 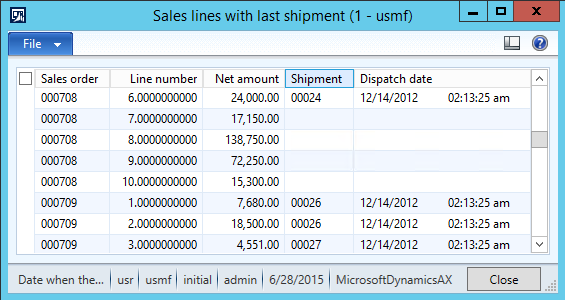 In my example, I’ll create a form showing information from sales lines and from the last shipment for each sales line. It’s based on a real implementation, nevertheless it’s simplified so we don’t have to deal with too complex computed column or form. (Also please don’t forget that computed columns are not supported in AX 2009 and older versions). First of all, create a view and call it SalesLineLastShipmentView. 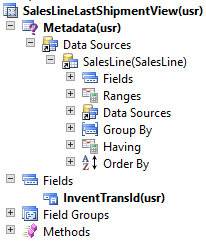 Add SalesLine datasource and drag InventTransId field from the datasource to the Fields node. If it’s not clear what it does, wait a moment until we look at the resulting SQL query; it will be much more readable. Save the view, open it in table browser if you have some shipments in your system, you should see them mapped to InventTransIds. If you’re curious, open SQL Server Management Studio, find views in your AX database, right-click SalesLineLastShipmentView view and choose Design. It opens a view designer and you can find the actual SQL query there. This extremely useful especially if your view doesn’t work as expected and you want to see how exactly was translated to SQL. You should recognize the subquery defined in our view method. It finds the first only (TOP (1)) WMSOrderTrans record for each SalesLine and return the ShipmentId. If none is find, it returns an empty string instead of NULL (because AX doesn’t expect NULL values in this case). That’s handled by ISNULL() function. Note that you should always use ORDER BY if you look for first or last records, because otherwise the order is not defined and a different row may be returned every time you execute the query. Now we have a mapping between InventTransId and ShipmentId and because we want to see more fields in a form, we have to join tables to our view and build a form showing the fields. 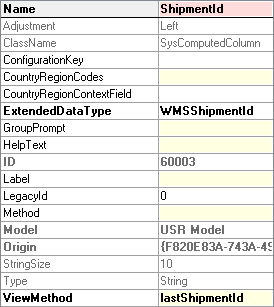 We don’t need the same procedure for WMSShipment, because it’s already handled by the table relation on WMSShipmentID data type. The last thing is to create a form design. To keep is simple, create a grid and drag some fields there from SalesLine and WMSShipment. Nevertheless computed columns add another dimension to views and allow you to use many more features of T-SQL. This ultimately allows you to implement business requirements that would be difficult to achieve by other means. Unfortunately the syntax for defining computed is far from perfect – it’s not easy to write nor read and you get little compile-time control. Here definitely is room for improvement. But this is definitely no argument for giving up all the power that computed columns offer. The topic is very beneficial one. Thanks for your post. the question I am asking is not related to the current post but it is a generic one. Adding View as datasource to a form takes more time for the data to display and it affects the performance. Could you please suggest to fast up the data retrieval. There is no general problem with views and therefore no general solution. It’s not clear what you’re comparing the view with if you say it takes more time (than something else). You’ll have to identify your particular problem before you can start resolving it. Another solution involves a NOTEXISTS join + extended query syntax. Take the related record table datasource, add a datasource of the same table with a notexists join to it, add the relation and then use the extended syntax in a range to compare via RecId (“(RecId < Parent.RecId)" for example). That one would work in 2009 as well. Btw, shouldn't the example code have comapred PARTITION and DATAAREAID in the computed column as well? I’m well aware of notexists joins, but I don’t see how you woould replace the this subquery with a join. You don’t know which RecIds to exclude – finding the right record is the whole point of the subquery with a sort and TOP 1. Yes, you would have to take partitions and companies into account in a real implementation. yes, the new NE datasource should have relations so that it exclude all records which don’t satisfy the original join. We can always do this exclusion since AX 2009+ allows a joined datasource to have relation conditions against the its parent’s parent. In most cases though, it is possible to avoid that and do the relation versus the related table instead, allowing for a simpler solution. DataSource_A(Main)->DataSource_B(Related). We add to the related datasource another datasource – using same table. ‘For every record of A, give me all records of B which have the same AccountNum – and where there does not exist another record in B which have the same AccountNum but a lower RecId.’ Since RecId is unique, only one record for each A could satisfy that. Oops, meant ‘higher recId’ in that sentence, and ‘only one B record for each A’. I still don’t see how you would achieve the same thing I did without a subquery. Can you please share the SQL statement that would do that? What you’re describing doesn’t seem to meet the requirements, as far as I can say in the moment. Can you show how you’ll join exactly one shipment with the highest delivery date for each sales line? I saw the question as ‘join only one related record for each parent record’, so I gave my solution for that (which also has a consistent order). A) Do the same query as earlier but using condition on DLVDATE. Because DLVDATE isn’t unique you can get multiple records with same maximum date. We will put this in a view. Because the data isn’t grouped, we can also put recId in the view. (SQL example below, can be done in AX directly as I have shown earlier). (I use an exists for salesline in the first view instead of outer join from salesline in the SQL, same result anyhow). Thank you for your contribution, nevertheless I believe you now see why I said that your approach couldn’t be used to achieve the same result as what what this blog post is about. Thanks Martin for share your knowledge, that is a good post!!! I think that is a solution when need to filter a display method into form. Is there a way to retrieve multiple fields from one subquery instead of making the same subquery execute for each field? And have 2 computed fields, Price and Quantity, populated from this subquery. No, you can’t define two computed columns that would somehow share the same subquery. Nevertheless you can get an identifier of the line (such as InventTransId or RecId) from your computed column and then use a join to get fetch fields you need. So I guess the join that would use this identifier will be performed outside the given view (in another, outer, view probably?). Anyway, thanks a lot for your feedback! The view gives you the ID and you can then use a query to join it with other tables. That’s exactly what my blog post demonstrates. Of course you can use the query in another view, if it makes sense for your particular scenario. Yes, it’s the same in AX 2012. It’s very clear when you look at the definition of the view in the post – it clearly doesn’t have any filters by Partition and DataAreaId. I didn’t want to complicate the post, but it seems that I should have pointed it out, because you’re not the first one commenting on it. In above example you are fetching data from SalesLine and only last shipment Id (i.e. one field) for those lines. Is there any way we can get all the data related to the last shipment Id against each SalesLine and make a view out of that data? OH got it. My bad. I have somehow missed the last section.